A bad boss can make a potential dream job a true nightmare. We've all heard stories about the nightmare of working for a toxic boss. Some of us have even had the unique displeasure of doing so ourselves. Disrespectful Behavior: "Don't overlook unprofessional behavior, such as emails that aren't returned or disregard for stop and start times for the interview without apology," says Anna Maravelas, president of TheraRising.com and author of How to Reduce Workplace Conflict and Stress. "These mini-moments are microcosms of your potential supervisor's style." Visual Cues: "If your boss scans you from head to waist versus waist to head as they extend their hand in greeting you, they are intuitively sending a message that you are smaller than they are," explains Zannah Hackett, author of The Ancient Wisdom of Matchmaking. Though subtle, it's the nonverbal equivalent of a belittling comment. "This is not a good sign that your talents are going to flourish in this environment." Defensive Body Language: "An insecure boss will find you threatening if you are good at your job and will use the power of the position to make your life miserable," says Pamela Lenehan, president of Ridge Hill Consulting and author of What You Don't Know and Your Boss Won't Tell You. Watch for constant shifting, avoiding eye contact or rifling through papers as you talk, she notes. Bad Attitude: If your interviewer exhibits a general lack of enthusiasm or interest in the company, watch out, warns Donna Flagg, a principal with human resources and management consulting firm The Krysalis Group. It could be a bad day, or it could be a bad boss. "Ask for company turnover [data] and turnover [data] for that individual manager," she suggests. Excessive Nervousness: Don't ignore extreme behavior, cautions one worker. "My boss used to eat sugar packets and raisins, and she downed them with large cups of black espresso," she recalls. "And she spoke in triplets: ‘hi, hi, hi,' ‘good, good, good,' ‘when, when, when.' Her stress level telegraphed to everyone in the department." 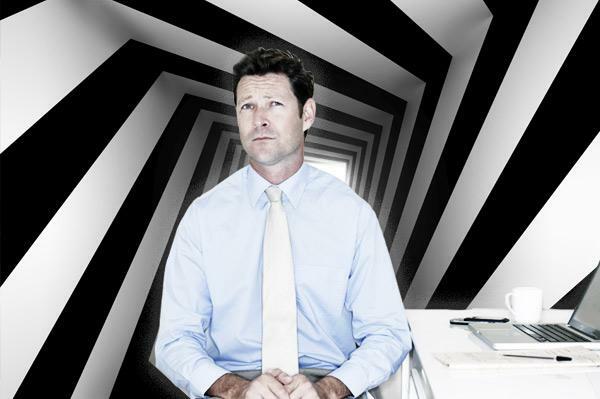 Distrust of Others: A toxic boss "openly displays a lack of trust in people, especially for those on the team in which he or she is supposed to lead," notes Gregg Stocker, author of Avoiding the Corporate Death Spiral. Ask what the company's problems are and what their causes might be. "If the answers to these questions consist of blaming others in the organization, especially those on his or her team, the person lacks trust in others." Fear Used as a Motivator: Ask the prospective boss about others on the team with whom you will be working -- specifically, how well they work together, stay focused and meet objectives, Stocker advises. Be wary if the response identifies a lack of respect for people. When managers disrespect and distrust others' motivations, they resort to extrinsic means with which to motivate, such as threats, public humiliation and comments about layoffs. Word Choice: "Your ears are your best hunch barometer," Hackett says. "Our choice of words sets up a dynamic that can raise or lower the energy in a room. If they begin every sentence with a negative message and then try to diffuse it somewhat, it is likely that negativity prevails in their life and carries over into work." Extreme Friendliness: "It may sound odd, but what should have tipped me off was how nice she was," one administrative assistant says of her toxic boss. "I compare it to children being lured into dangerous situations with candy. How many kids don't want candy? And how many adults don't want to work for a boss who is nice? It was a trap I could've easily avoided had I caught on earlier." Self-Absorption: "If his ideas seem to be more important than finding out about your ideas, or if you provide an answer and the interviewer tells you you're wrong or interrupts with his own answer to the question, it may be an indication that he will be difficult to work with," notes one technical support staffer.